The city is planning to invest at least $125 million to retrofit the 91st Street marine trash transfer station to make it handle 4,200 tons of garbage a day. Residents have been fighting the project for years. It sits next to an asphalt green play area. 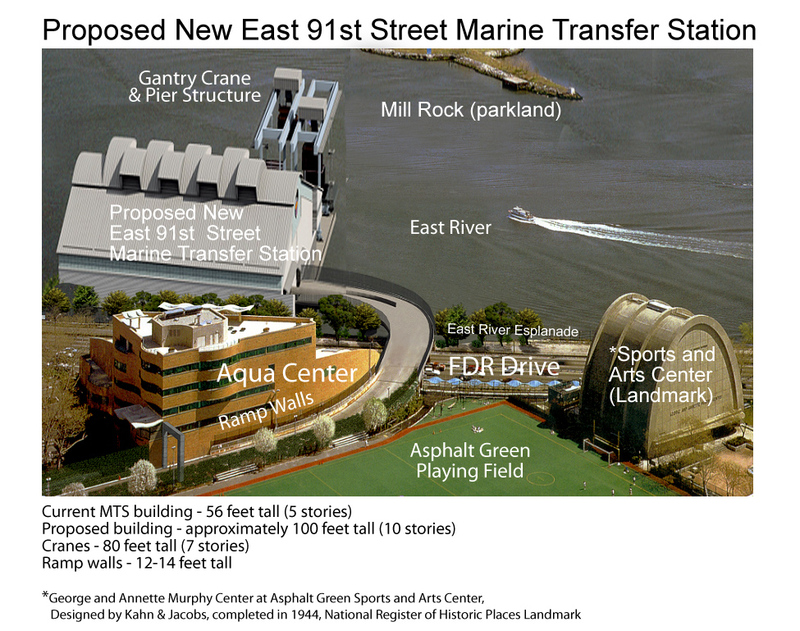 The Manhattan’s East 91st Street Marine Transfer Station is one of two trash transfer plants the city is planning. 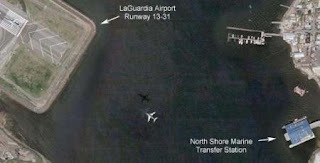 The other is in Queens next to LaGuardia Airport. AAEA-NY supports the 91st Street plan but opposes the LaGuardia plan. The 91st project has been in the works for the past 10 years. The plan was to construct a marine transfer facility at East 91st Street that would collect waste into containers and export it from several Manhattan community districts, rather than having all the borough's trash shipped to New Jersey. The 91st Street retrofitt could cost the city roughly $554 million over the next 20 years, according to a new report from the city's Independent Budget Office. That’s more than twice what it would cost the city to maintain its current system of trucking waste to New Jersey, which the report estimates would total about $218 million over the next two decades. A coalition of environmentalists, lawyers and neighborhood organizations support the 91st Street garbage facility as being necessary to bring relief to overburdened communities like Bushwick and the South Bronx that have long handled the majority of waste generated by New York City. 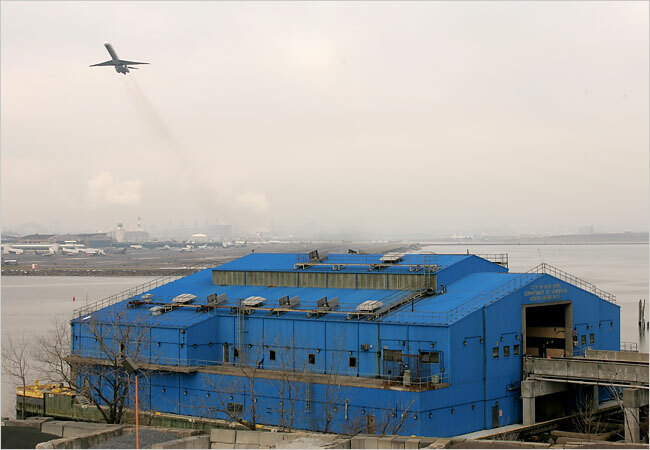 The North Shore Marine Transfer Station, which is being in built in College Point at 120-15 31 Avenue in College Point.near LaGuardia Airport, is expected to open in the spring of 2013 and will haul about 3,000 tons of Queens waste by barge to landfills each day. Even an enclosed facility is going to attract birds and it simply is not worth the risk. Construction has already started on the garbage facility, located 735 yards from one of LaGuardia’s runways. The station would be built directly across Flushing Bay from a runway at La Guardia Airport. Environmentalists in Los Angeles have a new approach to cleaning up some of the most polluted neighborhoods. The new plan calls for special zoning that would limit pollution and prioritize funding for small industries to purchase cleaner equipment. The pilot project aligns environmental interests with those of local businesses. 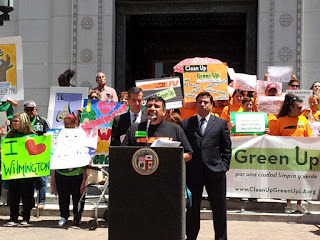 Specifically, the proposal is to make three L.A. neighborhoods Clean Up Green Up zones. The communities chosen have high rates of pollution and health effects caused by their location and the number of small and large businesses in the area. Businesses within these zones would need to limit any new noise, pollution or bright lights if they want to expand. But the proposal isn’t only about limits. It also channels money to businesses so they can make improvements. Researchers at UC Berkeley, the University of Southern California and Occidental College have created first of a kind maps that include all sources of air pollution, plus social information – where people might be more vulnerable, where there’s less access to health care – even where babies are being born early or with low birth weight.The researchers then shared these maps with community members so they could note unmapped facilities they think are contributing to emissions. The African American Environmentalist Association (AAEA), a national association dedicated to ensuring the input of African Americans and other minorities into public discussions of energy policy. We focus on regulations, taxes, trade policies, monetary policies, and environmental issues as they relate to energy policy. AAEA is dedicated to protecting the environment, enhancing human, animal and plant ecologies, promoting the efficient use of natural resources and increasing African American participation in the environmental movement..
AAEA is a strong advocate for U.S. energy prosperity and our organization raises awareness of the costs and consequences of policy changes for consumers. We believe it is important to ensure that minority communities are not burdened by artificially high energy costs. We also believe minority communities should be free to exercise a full range of choices in the marketplace, unburdened by short-sighted regulation or market manipulation..
To that end we stand in firm opposition to the EPA’s recent decision to penalize palm oil under the Agency’s management of the Renewable Fuels Standard. Palm oil is by far the lowest-cost biodiesel fuel source on the international market. By not allowing the lowest cost vegetable oil into the U.S. biofuel market, the EPA is ensuring that the RFS2 will lead to significantly higher prices at the pump as blenders rely on more costly vegetable oil feedstocks, like soybean oil and canola. Blocking its trade in the United States will unduly burden poor and minority communities. Minority communities are among those most sensitive to inflation in energy prices. Energy expenditures account for a far greater proportion of total expenditures in minority households than they do in other households. As such, minority communities are rightly concerned about any policies that threaten to raise energy costs. We have already seen the baleful effects of higher energy costs in recent months as prices paid at the gas pump have risen steadily. These price increases have meant minority households have had less money at their disposal for food, clothing, shelter, education, health care, savings and investment, and more. The EPA’s decision will make an unfortunate situation worse. Since minority groups face a relatively disproportionate burden when energy prices rise, minority communities have long been interested in a diversity of energy choices. More choices means more options when prices of one fuel rise. More choices means greater predictability and security when it comes to planning for the future. Restricting choices means minority groups are acutely vulnerable to price shocks in other sectors of the energy market. In addition to minority households, minority-run and operated businesses and their workers are also keenly interested in policies regarding energy availability and affordability. For example, truckers and independent rail and transportation owner operators are significant consumers of diesel energy, including biodiesel. Many of these workers are minorities, and many of the businesses are minority owned and managed. Indeed, the transportation sector has been important to ensuring upward mobility and economic growth for minority communities. As such, denying these communities the widest range of options in the energy market reduces their flexibility and their earnings prospects. It makes it more difficult to plan for growth, to hire workers and to expand operations that create opportunities and jobs for others. The advance of sophisticated biodiesel systems is one of the most promising technological developments in recent memory. It promises to lower costs and generate long-run efficiencies that will benefit all stakeholders. But the full promise of biodiesel will not be realized without ample global competition and diversity of supply. As such, the EPA would be wise to avoid manipulating the market for biodiesel and let competition and consumer choice determine the ultimate shape and contours of market. While we appreciate the EPA’s interest in ensuring a healthy domestic environment, we believe its rush to penalize foreign biofuel will do little to help America’s ecology and a great deal of harm to America’s minority communities. The EPA should reconsider its decision. In November 2011, Arnetta McRae assumed the position of President and CEO of the American Association of Blacks in Energy. 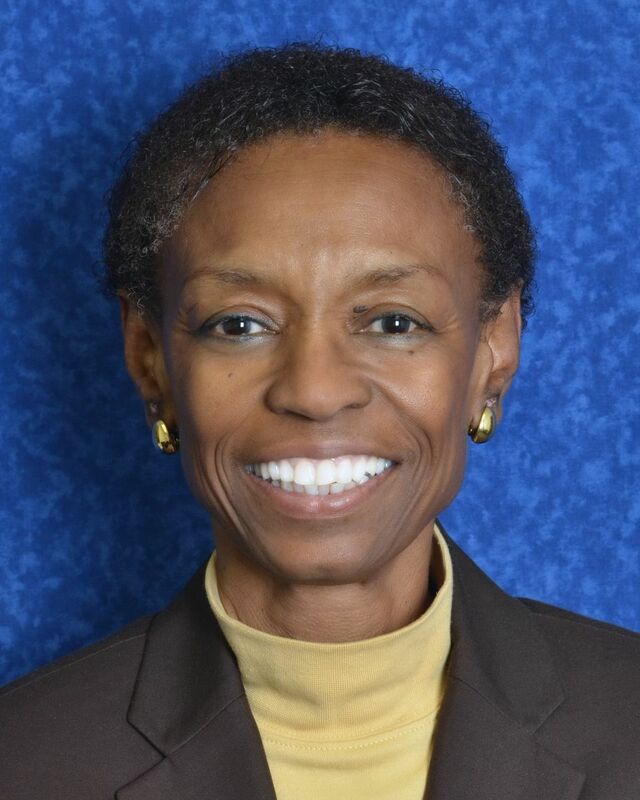 From 1996 to 2011, McRae served on the Delaware Public Service Commission assuming the position of Chair in July 2001. Previously, she was employed for 18 years as counsel with the DuPont Company, where she provided legal services for domestic and international business units. She also has held positions in commercial banking and human services organizations. 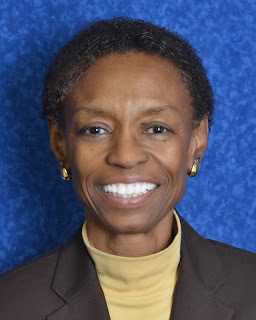 Over the course of her career in utilities regulation, McRae has served in a number of capacities at regional and national levels including president of the Mid Atlantic Conference of Regulatory Utilities Commissioner and on the Executive Committee of the Board of Directors of the National Association of Regulatory Utilities Commissioners (NARUC). She currently is a member of NARUC's Subcommittee on Utility Marketplace Access Partnership, Board of Directors of the National Regulatory Research Institute and the Advisory Council of the New Mexico State Center for Public Utilities. 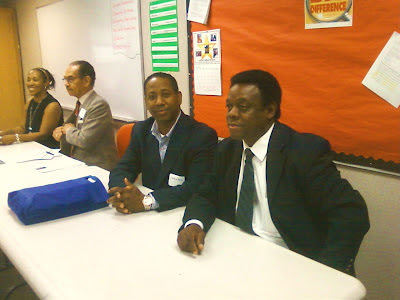 AAEA President Norris McDonald participated as a panelist at the Cardozo Senior High School Third Annual Industry Day. The Industry Day is sponsored by TransTech in collaboration with the Academy of Construction and Design and hosted by the National Association of Black Women in Construction (NABWIC) and Lockheed Martin. Specialists addressed four broad areas: 1) Aviation, 2) Construction, 3) Engineering and 4) Transportation. Cardozo Senior High School students attended the sessions with a general theme: "Preparing Students For College and Workforce-Linking Industry Leaders To The Classroom." Industry Day presenters included representatives from a broad range of industries, including: aerospace, construction, engineering, environmental, transportation, consultants, government, architecture, and media, among others. The afternoon Construction Session was facilitated by Sherry Snipes, American Institute of Architects and included panelists: Edward M. Johnson, Edward Johnson & Associates PC, and Jacque Ross, R & D Develpment, Inc. The sessions were held at the Cardozo High School Academy of Construction and Design. The Academy of Construction of Design was created by the District of Columbia Public Schools Office of Career and Technology Education and the District of Columbia Students Construction Trades Foundation to develop student skills in carpentry, electricity and plumbing. The students are equipped with necessary skills to move successfully from high school to an industry seeking competent workers. Students engage in a core academic course that includes: basic safety, construction mathematics, introduction to blueprints, hand and power tools and more. Students also participate in hands-on programs and field experiences. Each student is also received certification in first aid, cardiopulmonary resuscitation (CPR) and OSHA 10 hour safety course. Will Black Contractors Get Some of the Construction Work? South Carolina Electric & Gas Company SCE&G), principal subsidiary of SCANA Corporation (NYSE:SCG), and Santee Cooper, South Carolina’s state-owned electric and water utility, have received approval for combined construction and operating licenses (COLs) from the Nuclear Regulatory Commission (NRC) for two new nuclear units at V. C. Summer Station in Jenkinsville, S.C.
SCANA received approval for licenses to construct and operate units 2 and 3 at the V.C. Summer nuclear power plant site. About 1,000 workers are currently engaged in early-site preparation work at the V.C. Summer construction site. The project will peak at about 3,000 construction craft workers over the course of three to four years. The two units, each with a capacity of 1,117 megawatts, will then add 600 to 800 permanent jobs when they start generating electricity. SCE&G is a regulated utility engaged in the generation, transmission, distribution and sale of electricity to approximately 664,000 customers in South Carolina. The company also provides natural gas service to approximately 317,000 customers throughout the state. More information about SCE&G is available at www.sceg.com. SCANA Corporation, a Fortune 500 company headquartered in Cayce, S.C., is an energy-based holding company principally engaged, through subsidiaries, in electric and natural gas utility operations and other energy-related businesses. Information about SCANA is available on the company’s website at www.scana.com. Santee Cooper is South Carolina’s state-owned electric and water utility and the state’s largest power producer. The ultimate source of electricity for 2 million South Carolinians, Santee Cooper is dedicated to being the state’s leading resource for improving the quality of life for the people of South Carolina. For more information, visit www.santeecooper.com. Hooked up with my old buddy David Hahn-Baker today. 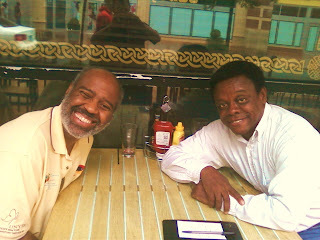 He is Inside The Beltway for a board meeting and staying with a friend in Silver Spring. We met out there and Dave updated me on his work. Wow. The man is busy. But David was always ahead of his time. In fact, there was a time when Dave and I were the only blacks working in the DC-based environmental movement. My my how times have changed. It was good to see Hahn-Baker. He is hobbled by MS and I carry the asthma cross. But we are still kicking. And evidently having the best times of our lives professionally. Dave is operating out of Buffalo now and is involved in a variety of issues, causes and environmental work. David walks with a cane and uses a wheelchair for more extensive getting around. But my boy is still sharp of mind, if not fleet of foot. We drove down to the part of Silver Spring near the Discovery Channel and found an outside place to eat. It was great to catch up and share some time. Baker, to me, is a legend. He cut quite the path in the environmental movement in the early 1980's. And though banged up a bit, he is as active as ever. We picked each others brains for ideas and broke bread together. What a time. Dave, you still inspire me. Recently, I had the pleasure of exploring Santa Catalina Island, which is 22 miles off the coast of California (from Long Beach). As a follow-up to our Compton To Catalina Program (CTC Program), I decided to really get to know the island. I took a few days to walk most of Avalon, the only incorporated city on the island. I had previously visited the island two times, once with my son and once with an investor to scope the island for a wood chip to electricity power plant we are promoting. My intent on this extended stay was to not only learn about the many activities that are available on the island, but to gain enough details to significantly enhance our Compton To Catalina Program. I would say goal was completely fulfilled. I took the tour bus up to the Airport In The Sky. That was one scary ride. It twisted and turned around the mountain road. There were incredible views. I took the Zip Line Eco Tour. That was fun. I will recommend it to CTC Program participants (but only if parents participate). I played the 9-hole golf course. I played 18 holes by playing from the white tees first and the blue tees second. I like the course. Other activities available on the island include para-sailing, snorkeling, scuba diving, boat rental, golf cart rental, bike rental (including battery assist), submersible tour, glass bottom boat tour, stand up surf boat rental, Jeep Eco tours, hiking, camping, Segway rental, miniature golf, mini-bowling and arcade, swimming, pedal boats, and a climbing wall, among other activities. I think it was important for me to personally see all of these activities so that I can make appropriate arrangements for CTC Program participants to experience them. The inner harbor area also has numerous retail shops, restaurants, eateries, hotels, a grocery store, drug store, post office and other facilities. I stayed at the Zane Grey Pueblo Hotel. I highly recommend it because it has the best view of any reasonably-priced hotel in Avalon. 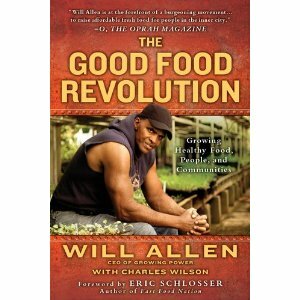 Will Allen: "The Good Food Revolution"
Will Allen’s book THE GOOD FOOD REVOLUTION (Gotham Books, May 10) goes on sale this week. Will’s journey as the son of a sharecropper, a stint as a pro basketball player and years as a successful corporate man for Proctor & Gamble and KFC, before returning to his roots and the earth. He has a MacArthur Grant, has been named a Time 100 Most Influential Person, and is a Forbes.com Most Influential Foodie, just to name a few. Please do not hesitate to reach out for a copy of THE GOOD FOOD REVOLUTION for review/feature coverage. The African American Environmentalist Association (AAEA) established a partnership with the Greater Union Baptist Church (GUBC) to operate an environmental tour called the “Compton To Catalina Program,” which takes students and other young people from Compton, California to Catalina Island. AAEA and the California Center for Economic Initiatives (CCFEI) are also partnering under the Compton To Catalina Program to expose Compton youth to boat repair and to provide technical training services. AAEA initiated its Compton-To-Catalina Program on Saturday, April 21, 2012, which is the day before Earth Day. The program began with a press conference at the Greater Union Baptist Church in Compton, California. Participants then traveled to Long Beach, California to board the Catalina Express to make the one hour trip to the island. Once on Santa Catalina Island, the participants boarded the Emerald submersible to observe underwater life around the island. Finally, participants toured Southern California Edison's electricity generating plant at Pebbly Beach, the island's primary electricity generation source. The Compton To Catalina Program is being operated thanks to a grant from Southern California Edison. GUBC recruits people to participate in the Compton To Catalina (CTC) Program. AAEA makes arrangements for the tours and facilitates educational experiences for the students. Each is a daylong affair that includes transportation to Long Beach, where the tours originate. Participants have escorts at all times and activities on the island are arranged to maximize the environmental experience. There are numerous activities available on Catalina Island, including: an Eco Tour Zip Line, hiking, biking, camping, swimming, snorkeling, diving, sightseeing, dining, shopping or relaxing, to name a few. Our main activities include a submersible ride to view submerged vegetation and fish species and an electricity power plant tour. AAEA, GUBC and CCFEI are providing important environmental and technical services to the youth of Compton, California. This partnership provides a rich environmental experience for participants. AAEA will engage institutions and individuals to support the program.